If you are in the market for a digital monitoring system, then you need to read the latest Spyera review. 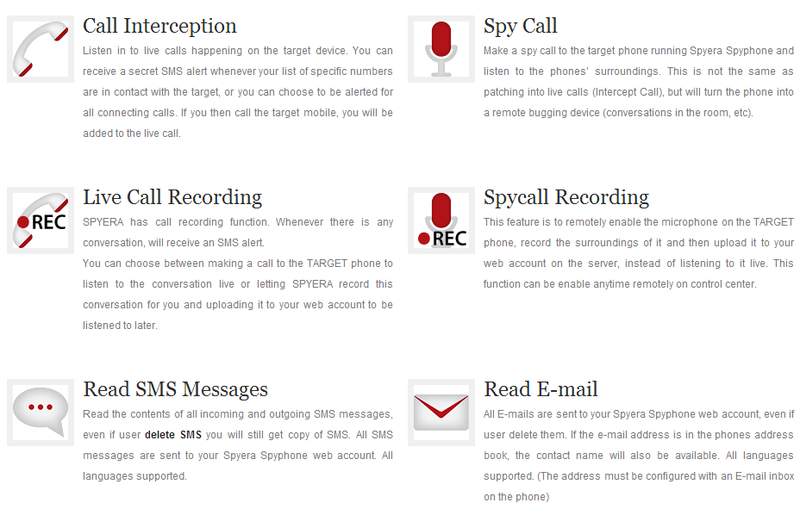 Spyera is a software program that, once installed on the device in need of monitoring, allows a user to check up on a number of communications. Benefits for Parents – The fact of the matter is privacy is a major concern in a modern digital day and age. However, parents have the right to monitor their children’s activities, and that responsibility includes anything a child may communicate via a digital medium. With Spyera you will know where your child is at all times. This program will help you sleep better at night. Benefits for Employer – Employers have even gotten into the game by loading spyware onto company-owned devices to identify employee wrongdoing. With Spyera you know where your staff is at all times also if they are working or taking care of private matters. Some of its more interesting features include the ability to download reports in .pdf, .csv. or .rtf format to have as a tangible data record. Unlike some software programs that enable users to listen in to live calls, this product features a spy call option that in effect transforms the phone into a monitoring device like a bug. When monitoring actual calls, individuals have the option to listen to them live or recorded online at a more convenient time. In addition, most of this functionality can be enabled or disabled as needed. The program uploads all of this information and more to an online web page. Only an individual with the correct account information can access that online account and the information it contains. You can remotely uninstall and control this software. Spyera is compatible with a number of smart devices including phones, tablets, and even personal computers. Popular devices for which Spyera has proven helpful are the iPhone, Blackberry, Android, Windows and Symbian smart phones. It takes only five minutes to download the spyware onto one of these devices. At this point they don`t offer the step by step installation process for non members. It should only take 5 minutes though to install it. They don`t dabble around with different upgrade programs it`s pretty forward they offer one product for your phone and everything is included. Most features included of any of the monitoring software we have seen on the market. Some special features like camera spy and listening in on surroundings are included. You can download your reports. You have to jailbreak your iphone (most monitoring software require this) yourself before installing the program, for some this might be an issue. As always when installing a monitoring software you need access to the phone. This software is more expensive than some of the competitors offering similar features. The product has a dedicated support team that rolls out updates paid subscribers can download at no additional charge, and the knowledge base they keep is fairly robust. You can easily contact them via email or phone. This product offers a few unique features, but at $189 for 3 months, it is also about three times more expensive than other quality competitors. There is no trial period, but it does come complete with a 10-day, money back guarantee. $289 is the price tag for 6 months and $389 for 12 months. You do get a better deal signing up for a longer period. Unlike other one-size-fits-all solutions, the software is tailored to the specific device to be monitored. This is a positive feature in the sense that it offers a monitoring system customized to a particular need. For most people, the cost of this software is unlikely to outweigh its features when compared to other quality competitors. As such, this Spyera review marks it at the middle of the class. Have you tried Spyera? Let us know what you think! By Going through website, I found product is Interesting, I have few quires, Please address the same. 1. I want to understand the functionality of the product, how exactly it works ? 2. Target phone, While doing conversation, if it is not connected to Internet, how the audio files will be recorded and shared ? 3. What is the audio file format ? 4. How long we can store or keep the data (audio files, IM Chat, Text Messages) in our account ? weather we can download the data to our local system ? 5. I need more clarity on “Spy Call” & “Spycall Recording” features – How and when this feature works ? 6. Weather this Product supports for WhatsApp messages ? I would suggest that you visit their website Spyera for more info. Currently Spyera is compatible with any Android phone. Android OS version up to 4.4.2 is fully supported. mSpy would work, they support the Moto G, Android 2.2+. You can read our mspy review here. I have plan to buy your product, I am based out of India (Bangalore), Please let me know, if you any office in India (please share the contact details of India Office). On behalf of me, Please procure, new handset, Root it and install your software and share with me. I am ready to pay the cost of the Mobile and Software as well. Does this also work with viber. And skype and is it comparable iPhone 4c? Yes Spyera will work with Viber and Skype. According to their site Spyera works with jailbroken iPhone that runs on iOS version up to 8.1.1, but you can always check with them directly. please does spyera monitor whatsapp audio files sent and recieved?? do you provide a keylloger on android phone?? how many time it takes to send logs to the dachboard?? Does this work when the target phone is not online or not connected with internet and record information in the device and upload when it gets internet? Will it still be working with the target phone if Sim is changed?